Paul lost my travel mug today. He left it on the side of the lake before we went canoeing (by the way, you should see Eli in a little tiny life jacket, it will make you want to eat him UP). Before we realized that we had left it there it was too late to go back. It is probably now in the hands of some redneck fisherman. They’ll probaby use it for bait. Now that I have that out of the way, I have to give my hubby major credit for taking a nine month pregnant wife and a two year old canoeing today. Remember, it is almost impossible for me to lift anything of substance above my head, so he had to get the canoe on and off of the car completely by himself. Stud. It was a beautiful morning and Eli did pretty good in the canoe. He wanted to stand up a few times and threw little fits when he couldn’t but I think eventually he will get the hang of it. No pictures of Eli’s first canoe trip because we didn’t want to get the camera wet. Thanks for listening. Enjoy this beautiful memorial day. This is my version of a green smoothie. You can find countless versions on youtube. When Eli started eating table foods I realized the value of a smoothie. I was able to hide many different vegetables in a smoothie without questioning from a picky baby/toddler. I’ve always liked smoothies, but only recently did I decide to hide vegis in my own smoothies! This is the secret: you can put an amazing amount of greens in a smoothie and not even taste them. It’s not that I don’t like my spinach, it’s just that it’s not usually my go to quick snack food. Often in the morning I will make a smoothie for all of us before I leave the house. Today I made them when Eli got up from nap. Eli loves them, Paul loves them, I love them: it’s a win, win, win. First, put a frozen banana in the blender. Next put 1 cup frozen blueberries and a lot of frozen spinach in. You may want to start out with less spinach and work up from there. Both the blueberries and the spinach I got at Costco. They sell a VERY large bag of spinach for about three dollars. I just take out what I think I will use fresh and freeze the rest to use for smoothies. Fill with a good amount of orange juice. You could also use a different kind of juice but OJ is my favorite. And blend! Ours turns out to be more of a “brown” smoothie because of the blueberries. Ignore the color, if you were to omit the blueberries, which also tastes just great, the color would be bright green. and two adult size smoothies. Hope you enjoy these as much as we do. Here are some of my favorite things about the weather recently. We have seven inches of snow on the ground and today was beautifully sunny and very cold. 1. Though we’ve been out of school for the past three days the school play went on as planned due to overwhelming parent request. Everyone showed up and made the effort to get there despite icy roads. 2. We’ve been meeting new neighbors, as everyone is out shoveling thier driveways today. Paul was asked to be in a barbershop singing group by one of them. He’s not considering it, by the way. 3. We delivered Christmas gifts from our church. One house was just down the road so we pulled Eli in the sled down the road with our Christmas gift. 4. We decided to go to Walmart today because there is another 6 to 10 inches of snow predicted for tomorrow. Everyone else had the same idea. Even though it took me literally half an hour to get through the checkout line I saw many people I knew and had some great conversations. 5. Walking in the dark down my parents driveway (it’s steep so we park at the top) for turkey soup. It has really been an adventure around here. I’ll keep you posted about the “blizzard” supposedly coming tomorrow. Did you know that one of the most clicked on posts I have ever done is this one from last year? 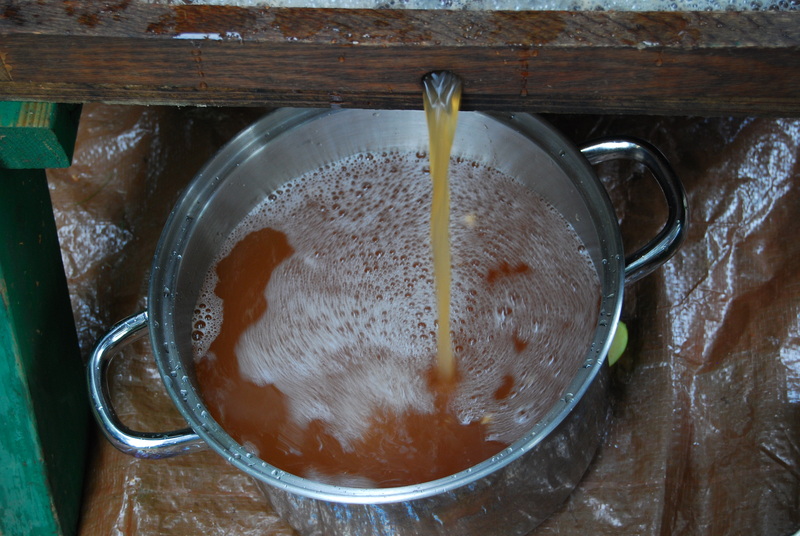 It’s shocking to me that people can type “how to make apple cider” into google and get my blog. Apparently, making apple cider is HOT right now. Anyways, it is in our part of the country. 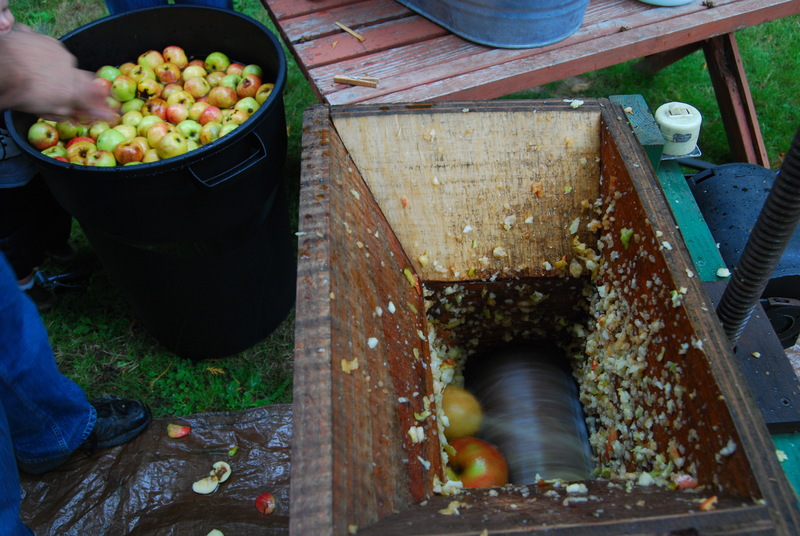 According to one of my coworkers – it’s every man’s dream to have a cider press. If the twelve gallons we’ve made so far this season are any indicator then she’s right. Yes, that is a garbage can full of apples (it’s clean). This will be strained and heated to 160 degrees before we freeze it (alot of it will go in our tummies before that though). I love this time of year because of all the produce that we put away and eat. Have you ever had a grilled cheese and heirloom tomato sandwich? You haven’t lived until you’ve tried it! Also, I did try the recipe from “Artisan Bread in Five Minutes a Day”. I’m hooked. The idea is that you make a large batch of high moisture dough that you keep in your fridge. There’s no kneading involved and it really is very easy. 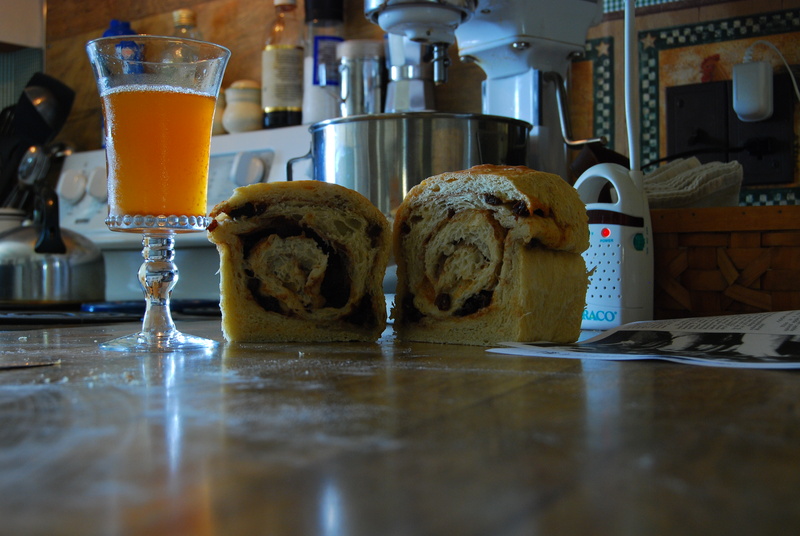 I made a hard, crusty loaf the first day and today I tried cinnamon raisin bread. Both turned out very well with minimal effort on my part. Paul asked me today if we could can some apple cobbler filling (he can’t stand to see a fruit go to waste). Instead – we cut up the apples, added sugar, cinnamon, cornstarch and lemon juice (using my standard cobbler recipe from the Best Recipes cookbook) threw it all in a ziplock bag and froze it. We made four large cobblers worth. What do you think? Will it work? There’s no reason it shan’t! Posted on September 14, 2008 by parobinson | Enter your password to view comments. Yesterday we went to Olympia – without Eli or a plan of any kind. I think those are the best kind of days – the no plan part not the no kid part. Anyway, we tried out Caffe Vita. It reminds us of Stumptown. You know you are sure to get good coffee when the baristas and unaffected and aloof! Also, we stumbled upon a CLOTH DIAPERING STORE. Check this girl out – Simple Cloth. We will definitely be there next time we need to go up a size. We went to the Olympia Farmers Market, and laughed at the people buying zucchini for 2$ a pound. Also the yummy Alaskan Salmon. It is one of the best farmers markets I know of. For lunch we went to the Bread Peddler. Roast beef and bleu cheese on foccacia with chocolate orange cake for dessert. We really spoiled ourselves. Check these places out next time you are in downtown Oly.